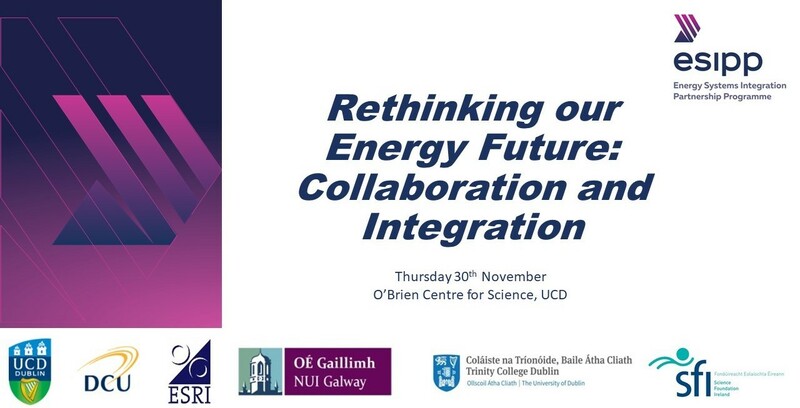 We are delighted to announce that registration is now open for the Energy Systems Integration Partnership Programme (ESIPP) research symposium taking place on Thursday 30th November in UCD. This symposium aims to showcase the research being carried out by the ESIPP research team and emphasise the importance of collaboration with a range of stakeholders. We hope you will be able to join us for this exciting event which will feature a number of national and international experts in the area of Energy Systems Integration. The event will also include an interesting panel discussion on “Targets for 2030 and the role of Energy Systems Integration”. For more information on the event and registration, please click here. Please register early as spaces are limited. We now have an opening for a Research Finance and Operations Manager for the ESIPP project. Please see the Operations tab on our Recruitment page for more information. Closing date for applications is Thursday 19th October. There are still some research opportunities available on our Recruitment page. Further information on the PhD position on on Energy Systems Integration in the context of the Residential Building End Use Sector is available here. During the IEEE PES General Meeting Federico Milano was awarded a recognition for his participation to a Task Force on Test Systems for Voltage Stability Analysis and Security Assessment. The report prepared by this TF was published in 2016 and is now one of the most downloaded documents of the IEEE publication database. Applications are now invited for the 5 Year Temporary position of Lecturer/Assistant Professor in Gas Engineering,UCD School of Chemical and Bioprocess Engineering and UCD School of Mechanical and Materials Engineering. The main responsibility of the person who will be appointed to this position will be to drive leading-edge research in Gas Systems and Gas Engineering, both within the ESIPP programme and in undergraduate and postgraduate research projects and teaching activities of relevance to the two Schools. For further information on this position and other positions please see the UCD Job Vacancies portal using Job Reference number 009227 or the keyword "ESIPP". Applications are no longer being accepted as the closing date has passed.